🎧 We are reviewing the Bluedio TM / Bluedio T Monitor, a super affordable over-ear wireless headphone from Bluedio. The Bluedio TM / Bluedio T Monitor features giant 57mm drivers (as the Bluedio T6, Bluedio T5 and most Bluedio headphones), a wireless Bluetooth v5.0 connection and “artificial intelligence”. 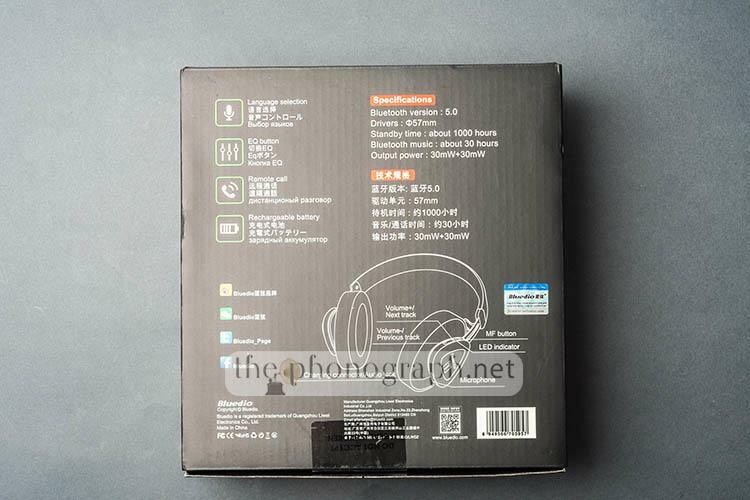 Bluedio calls the Bluedio T Monitor / Bluedio TM a headphone with “artificial intelligence” because of the their proprietary App that enables the use of Alexa or Baidu cloud service voice assistants. With either service you can voice-control functions such as play music, getting weather updates, setting reminders, getting news updates, making online orders, calling a car service, etc. 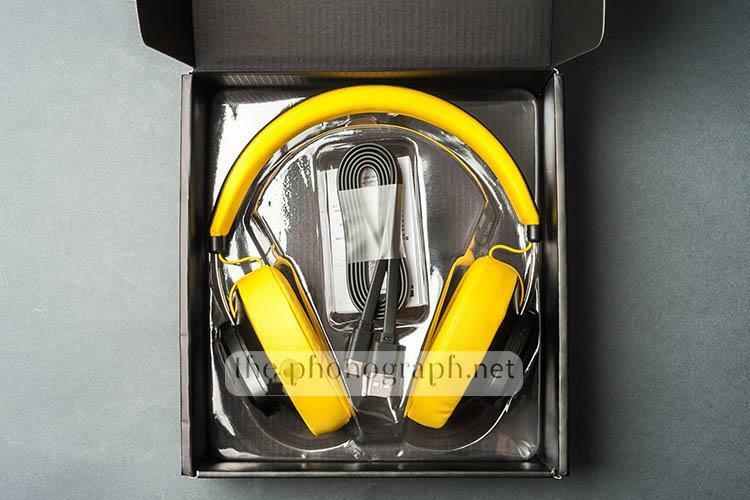 The Bluedio TM have a simple but super clean design and if you get the yellow or red one, the color combinations with black makes them a delightful headphone to look at. Bluedio promises 30 hours of continuous playback on a single charge – a full charge takes aprox. 2 hours. Moreover, a quick 10 minutes charge provides 2.5 hours of battery life. Bluedio TM / Bluedio T Monitor weight in Ounces and Bluedio TM / Bluedio T Monitor weight in grams. The Bluedio TM / Bluedio T Monitor unboxing results in the unit itself and an USB-C charging cable. Everything comes inside a fairly small packaging with a black background color. An USB-C to 3.5mm cable is not included but we tried to connect them with one and can certify that the Bluedio TM can be, also, used wired without battery charge. Using the Bluedio TM / Bluedio T Monitor in Bluetooth mode, their bass is punchy and fairly deep but with a bouncy tendency. Sincerely, most normal consumers will not notice the bounciness and will, instead, feel happy with the energetic profile. Their bass is clearly fun and tuned for energetic sessions but it does not fall into a muddy mess nor is limited to a bass-only sound signature. Expect a fun and full sounding bass but not a basshead profile. An EQ can unleash a crazy amount of punch and depth. Testing the Bluedio TM / Bluedio T Monitor in wired mode showed no sound difference, except for a noticeable lower volume output. The Bluedio TM has fairly strong mid bass bleed but crisp higher mids. Male vocals do not sound too distant and despite suffering from some congestion they are sufficiently alive. Higher mids are right on the edge of becoming harshy. Overall, their mids have a very warm sound but with clear higher mids. An EQ can reduce a great amount of mid-bass bleed and give their vocals a noticeable boost with efficient results – higher mids should not be boosted to avoid strong harshness. Midrange did not show any sound modification between Bluetooth and wired mode – besides the lower volume output. The Bluedio TM / Bluedio T Monitor resolve a nice amount of detail and are able to offer sufficient brightness (for normal listeners). This is not an audiophile-targeted headphone and you should not expect it to be, still the amount of detail resolved and sufficient balance between non-too dark nor too bright highs will surely make happy many customers. Moreover, their peaks do not exhibit sibilance nor piercing highs. An EQ reveals the true potential of their highs in both brightness and detail, becoming a miles-better performer than their price tag might suggest. Exactly as with bass and mids, their highs exhibit no sound difference between wired and wireless modes. The sound leaking out of the Bluedio TM is somewhat stronger than many average headphones. Still they will not be unusable on normal city situations, think of them sort of inline with headphones such as the Bluedio T6, Edifier W806BT, Xiaomi Mi Gaming Headphone lower than the COWIN E7 but stronger than the Xiaomi Mi Bluetooth Headphones TDLYEJ01JY, Xiaomi Mi Headphones Comfort TDSEJ02JY and the Xiaomi Mi Headphones 2nd Generation TDSEJ02JY. The sound isolation provided by the Bluedio TM / Bluedio T Monitor is fair but not extreme. Partial awareness of your environment will almost ever be present unless a higher volume output is set. The Bluedio TM / Bluedio T Monitor are super light with, still, a rugged metal structure and nice soft padding on both the headband and pads. The oval-shaped pads give a comfortable support and offer a full over-ear fit. The light weight of the unit, large pads and simple design result in a phenomenal level of comfort but it is fair to point out that the cups are fixed, do not rotate nor tilt. The Bluedio TM showed a very important improvement and refinement of their baseline sound quality by applying custom equalization. Bluedio TM / Bluedio T Monitor size and Bluedio TM / Bluedio T Monitor fit. The Bluedio TM T Monitor might sit as the most affordable full-sized headphone from the brand but has proven to pack a sound quality that hits way above it's price. Normal consumers looking for a fun, warm but not overly muddy sound and with good detail and brightness, will get a superb bang for buck with the Bluedio T Monitor / Bluedio TM. How many drivers does the Bluedio TM / Bluedio T Monitor have? The Bluedio TM / Bluedio T Monitor is a single driver headphone. Which means that the Bluedio TM / Bluedio T Monitor has 1 driver per side. What type of headphone is the Bluedio TM / Bluedio T Monitor? The Bluedio TM / Bluedio T Monitor is an over-ear headphone. The Bluedio TM / Bluedio T Monitor is an open, semi-open or closed back headphone? The Bluedio TM / Bluedio T Monitor is a closed back headphone. Does the Bluedio TM / Bluedio T Monitor have a microphone? The Bluedio TM / Bluedio T Monitor have a microphone and a remote. What is the price of the Bluedio TM / Bluedio T Monitor? You can check the most up-to-date price of the Bluedio TM / Bluedio T Monitor by following THIS LINK. Where can I buy the Bluedio TM / Bluedio T Monitor? Which Bluedio TM / Bluedio T Monitor colors are available? What cable do the Bluedio TM / Bluedio T Monitor have? The Bluedio TM / Bluedio T Monitor have a detachable, single-sided, flat cable. What cable connection does the Bluedio TM / Bluedio T Monitor have? The Bluedio TM / Bluedio T Monitor cable connection has a USB-C plug. Are there replacement cables for the Bluedio TM / Bluedio T Monitor ? The Bluedio TM / Bluedio T Monitor cables can be replaced with compatible USB-C replacement cables. Are there upgrade cables for the Bluedio TM / Bluedio T Monitor ? The Bluedio TM / Bluedio T Monitor uses USB-C cables which are very popular standard cables. You can buy any cable with an USB-C connector to upgrade the cable. Does the Bluedio TM / Bluedio T Monitor have Bluetooth / The Bluedio TM / Bluedio T Monitor is a wireless headphone? The Bluedio TM / Bluedio T Monitor is a Bluetooth wireless headphone. Is the Bluedio TM / Bluedio T Monitor compatible with Apple devices? The Bluedio TM / Bluedio T Monitor is fully compatible with Apple devices. Is the Bluedio TM / Bluedio T Monitor compatible with Android devices? The Bluedio TM / Bluedio T Monitor is fully compatible with Android devices. What is the S version of the Bluedio TM? In the case of the Bluedio T Monitor / TM, the “s” model is called Bluedio TMS, adding active noise reduction.